So let's take a look at my Card with Folded Well. Below is the video I posted on Facebook Live to unveil this card. 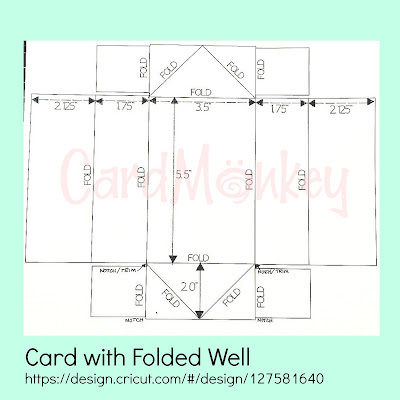 The "well" in the card can hold just about anything that is flat and fits -- a note inside, a package of seeds, sequins, a gift card, you name it! 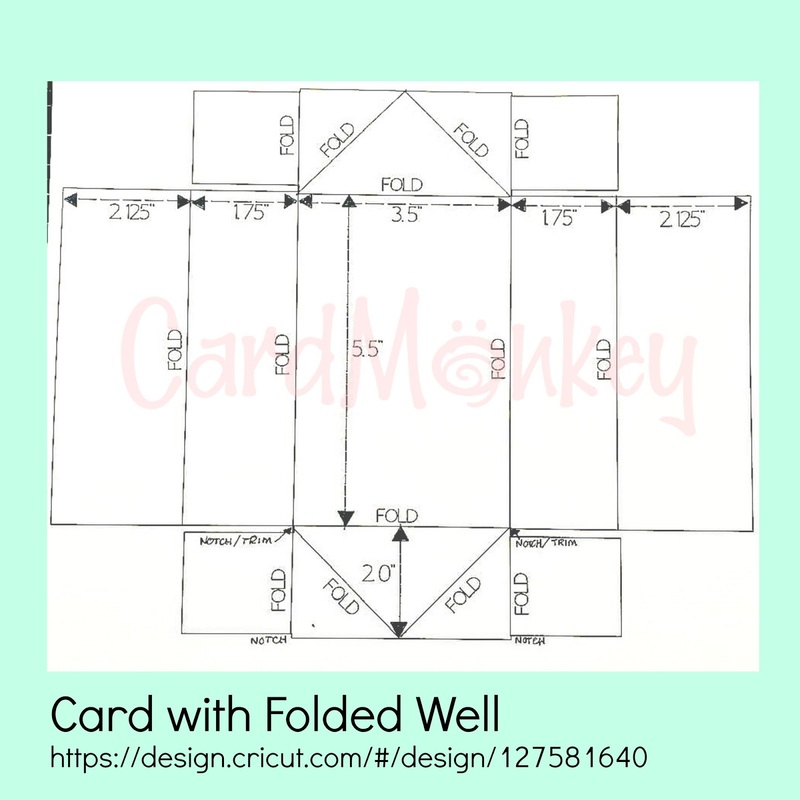 One of the things that I am working on doing for my readers is making a Cricut cut file for my Interactive Cards. To use this file, you'll need to be using Cricut Design Space, with an Explore or Maker. This file will automatically cut and score the design shown above, reducing the time spent on making this card down really significantly. Here is the LINK (click here). You can decorate each of the panels (left and right) if you'd like, and not have an element to hold this "well" shut. You could also put a "belly band" around the card to hold it shut. 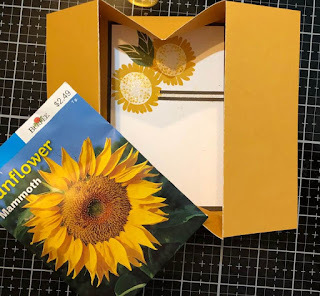 OR, you can put a piece of decorated cardstock (4.25"w x 5.5"h) glued onto the top, with a "zipper" in the middle (as shown in the video), or with ribbons holding it shut, etc. Let your creative wings fly! For the sunflowers, I found a single sunflower in Cricut Design Space, and welded two other sunflowers in a "vine." I also altered a tag shape to include a shadow; the sentiment is stamped. 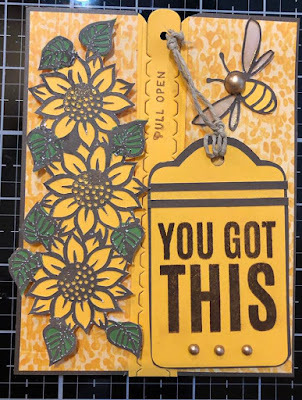 The bumblebee is cut from a Cricut DS shape; a favorite part of the bee would be her wings -- I backed them in Vellum and painted them with Wink of Stella gold. It has a zip die in the center from Technique Tuesday. 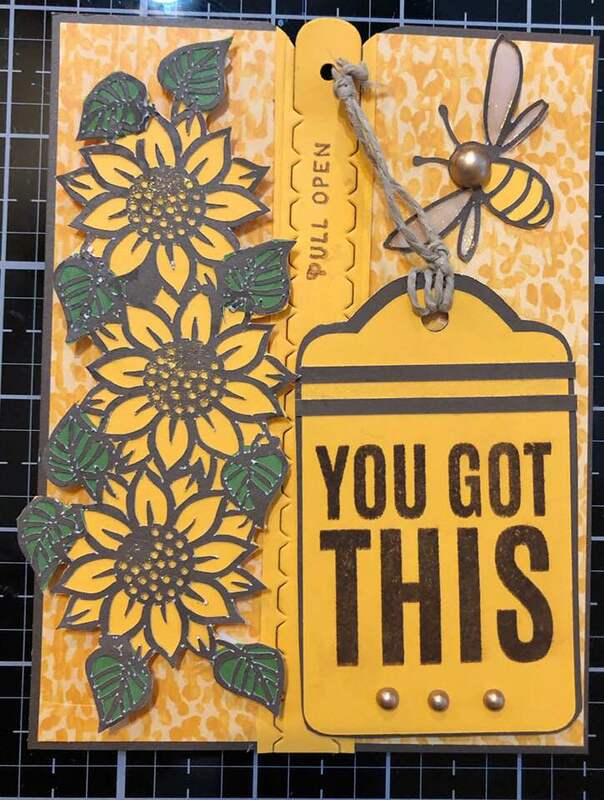 For the inside, I stamped some sunflowers into the upper left corner of a card, and glued some stripes to match the front's tag. And the gift included in the well is a package of sunflower seeds. I made this for one of my dear friends who is facing some surgery this week. I'd love to see any cards you've made like this -- please find me on Facebook (click that link) or send an e-mail to cardmonkey@comcast.net. 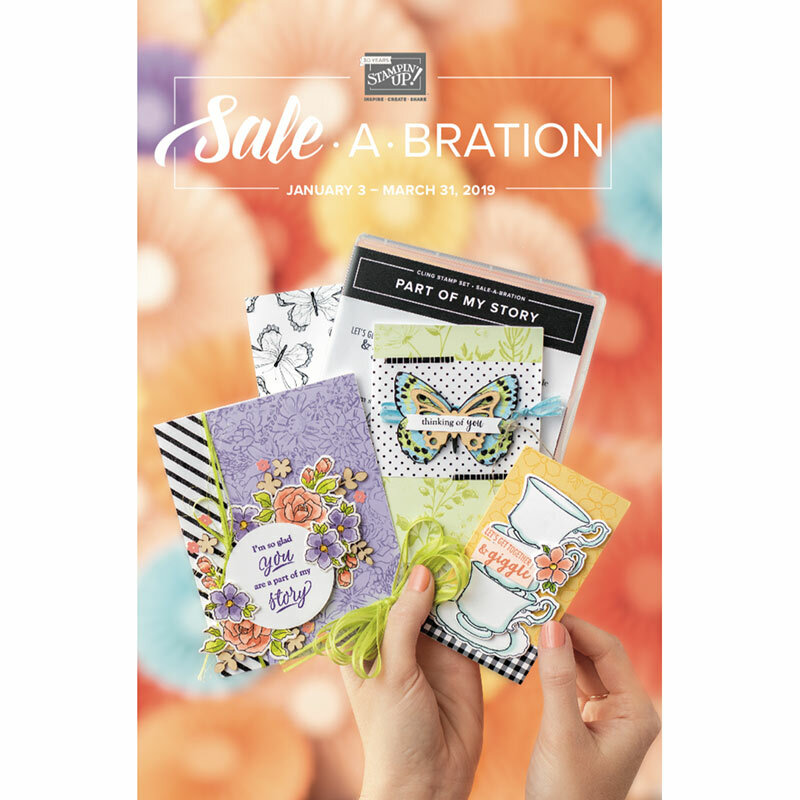 For supplies (including that pretty yellow print paper, above), please come over and shop with me at Stampin' Up! 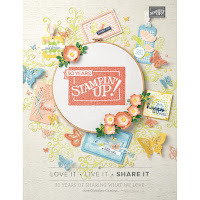 Click the SU words there for a link to my shop site, or visit: cardmonkey.stampinup.net. That really is an unusual and beautiful card with a definite WOW! factor. Not having the Cricut, I appreciate the dimensions.